Real Madrid have reportedly turned down an offer from super-agent Jorge Mendes to seal the transfer of Monaco goal machine Radamel Falcao. The Colombia international is one of the most deadly centre-forwards of his generation, having scored 260 goals in his club career in South America and Europe and a further 30 for his national team. While Falcao notably flopped in his two seasons in the Premier League in loans first at Manchester United and Chelsea, he has found his scoring touch again in the last few seasons with Monaco. The 32-year-old scored 30 goals in all competitions in 2016/17, helping Monaco win the Ligue 1 title, but Don Balon report that Madrid were not keen to take Mendes up on his offer. 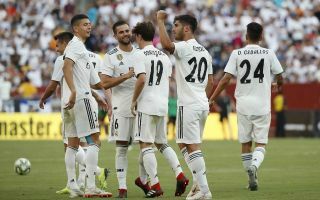 The report claims Real plan instead to try using Gareth Bale or Marco Asensio in false 9 roles up front this season. Falcao’s age may also be a factor, with the player only likely to decline somewhat in the next few years. This means it’s perhaps not an ideal signing for Real this season as they surely need fresh blood and a new generation of Galacticos after selling Cristiano Ronaldo to Juventus.